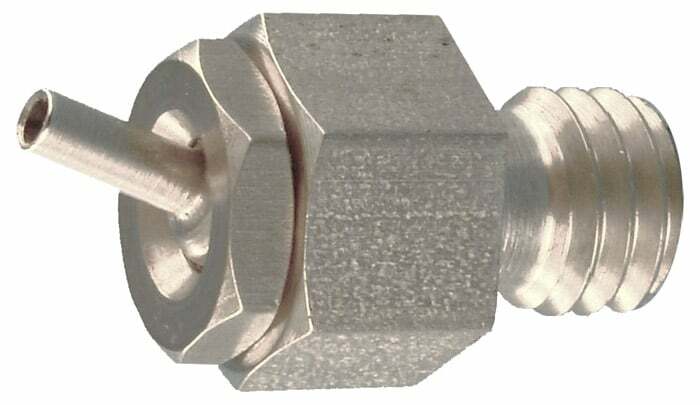 PressureMax *Complete Coolant Nozzles (Metric) » Rovi Products, Inc.
High velocity coolant stream increases productivity and tool life in machining and grinding operations. Also ideal for low pressure applications where abrasive swarf is a problem. Hits any target above mounting plane. Choose short extensions for tight spaces like CNC Turning Centers and Screw Machines. Choose stainless steel bodies when using cutting oils not compatible with brass (i.e. oils containing active sulphur). Choose brass bodies for economy. 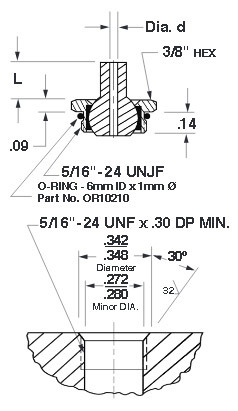 Pipe sizes to fit M6, M8 & M10 threads. For NPT/BSPT & UNF click here. Rated to 1500 PSI Max (100 bar). Longer extensions are a breeze to aim and shoot farther, great for Machining Centers and CNC Multi-Axis Grinders. High velocity coolant stream prolongs tool life and aids chip control. Short extensions aim easily with aiming tool (included). Interchangeable spray tips allow you to easily change orifice size and extension length to suit your application. PressureMax Spray Tips can be mounted directly to toolholders or manifolds when space is limited, as in screw machine applications. See tables below for port preparation detail. Long extensions aim easily by hand. Angled outlet versions can hit just about any target above the mounting plane. 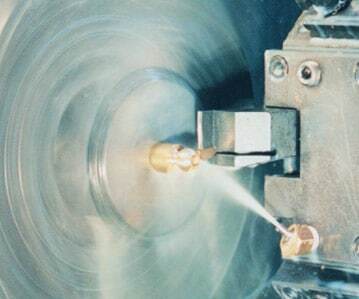 PressureMax nozzle shown in use on CNC turning center. 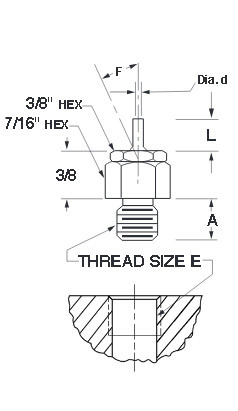 Determine the port thread size required for your machine tool. Choose nozzle body material (brass for general purpose, stainless steel when using cutting oils not compatible with cuprous alloys). Determine orifice diameter required to match your pump’s capacity at the desired pressure (refer to table on page 2). Choose the extension length “L” to suit your application (longer extensions give more laminar flow, aim easily and shoot farther, while short extensions are ideal for tight spaces or where stringy swarf is a problem). Nozzle & Port Detail Mtl. Size “E” Part No.